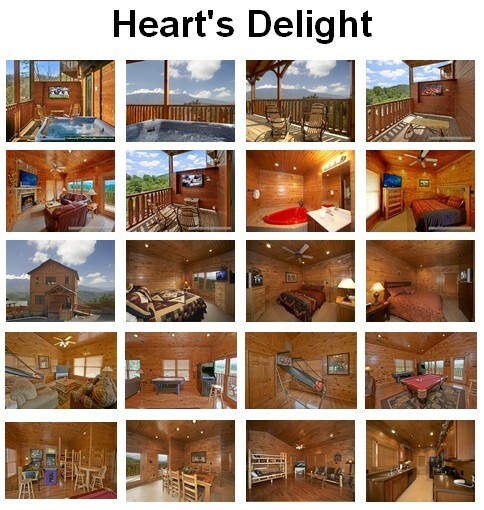 Heart’s Delight is a 3-bedroom luxury rental cabin in Gatlinburg Falls Hidden Valley Resort, in a secluded location in a beautiful resort. The cabin sleeps up to 12 people in comfort, with amenities inside and out to please every taste. Inspiring views of Mt. LeConte and Great Smoky Mountains National Park from the hot tub on the deck may compete with watching the game on one of the several large-screen TVs, on the deck and inside. The game room itself is packed with fun, from pool table to arcade games to air hockey. And there’s the indoor basketball game to shoot some hoops regardless of the weather. 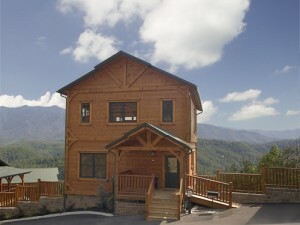 The cabin is wheelchair accessible with a ramp to the front door, and offers plenty of parking. With 4 full bathrooms, queen sleeper sofas, rocking chairs on the deck and plenty of entertainment, Heart’s Delight is a great cabin for a family reunion or group of friends. And there’s privacy enough for coziness, including the heart-shaped jacuzzi in one of the bathrooms.